Johan Chu’s research examines the shifting bases of social power and corporate competitive advantage in today’s technologically-advanced world. Recently-developed technologies allow low-cost, wide-reach communication, and democratize access to markets, knowledge, capital, and labor. How do these developments alter the dynamics of social contention and market competition? In one stream of research, he explores the factors leading to the durable dominance of companies, products, ideas, and people. This work not only suggests strategies for dominants and would-be dominants, but also sheds light on the causes of inequality and stratification in society. A second stream of research studies how individuals and companies direct mass attention—cause a large number of people to collectively attend to the same target (object, person, event, phenomenon, or way of seeing) at the same time. Recent technological advances have made the ability to direct mass attention hugely consequential. How do competitive dynamics change when competition is based on technologies of mass attention direction? A third stream of research seeks to understand how organizing and work are changing in the 21st century, examining diverse settings from corporate boardrooms to gig working to blockchain-based deliberative platforms. 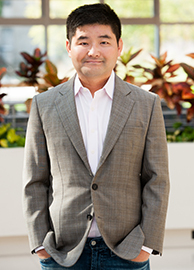 For his empirical studies, Chu uses very large datasets, social network analysis, simulation, machine learning, and computational text analysis, coupled with in-depth interviews with industry participants. Chu earned a B.S. in physics from the Korea Advanced Institute of Science and Technology (KAIST), a Ph.D. in physics from the California Institute of Technology (Caltech), and a Ph.D. in management & organizations from the University of Michigan’s Ross School of Business. In between Ph.D.s, Chu spent thirteen years in consulting, start-ups, and executive search. He consulted for clients in the United States, Korea, and China. He founded, grew, and sold an enterprise software platform venture, and was later the CEO for another venture. Chu’s final industry position was at the world's largest private executive search firm, where he was the Asia-Pacific Consumer Practice leader.